Family Fun with Oma and Papa! Oh dear, I have really been neglecting this blog. All week long I've been meaning write this post and put up these pictures, but I've been majorly procrastinating everything. My parents were here all last week (Sept. 10-19) and when they left on Monday, Bryan left also. Sadly his grandpa passed away and he went back to Michigan for the week to be with his family. Dylan and I went from having a very full house of people to a very quiet house. Better late than never, I suppose. On the day that my parents arrived, Dylan and I went to his buddy's birthday party in the morning while Bryan went to the airport to fetch my parents. By the time we came home from the party, I knew my parents would be at our place, so I kept saying to Dylan that Oma and Papa would be at our house when we got home, but he didn't really believe me. As we climbed the stairs to our apartment Dylan began chanting "Oma, Papa, Oma, Papa, Oma, Papa" with every step. As we opened the door, my dad was standing there and Dylan froze in complete shock that he was actually here. Then he started pointing and shouting "Papa! Papa! Mommy, Papa's here! Papa's here!" He then set out to find my Mom who was upstairs resting from the long trip, and we all climbed up the stairs and Dylan in pure elation of having both his Oma and Papa here literally jumped up and down for joy. 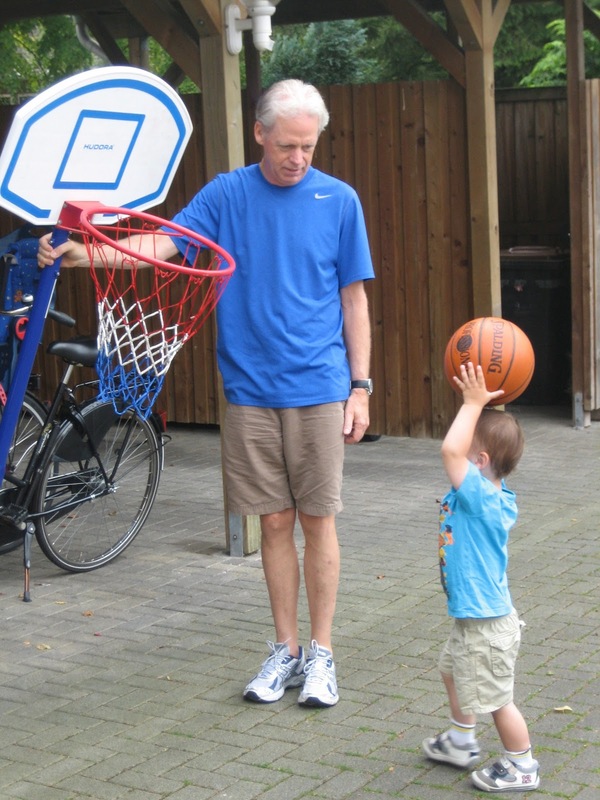 Dylan was quick to show Papa his basketball skills, which he still calls "shots." It's pretty funny to have your two-year-old constantly telling you that he wants to go do shots, but we understand he means basketball and not vodka. This is the only family photo that we got, which was taken just a few hours after Mom and Dad got off the plane. I had told them over and over again to plan for fall weather and the day they arrived it was in the 80s. Good thing they each brought one pair of shorts. Our friends loaned us some bikes for my parents so we could all take bike rides together. Our first day we headed out to Hoxfeld / Probsting area to the playground. Dylan got really revved up going down the big slide with my dad. Both of them had dirty pants from going down the slide so many times. We also enjoyed a picnic. 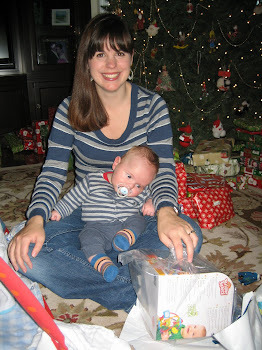 Check out Mom and I both making sure Dylan doesn't spill his cup of juice. Bryan had a basketball scrimmage that we all went to and Mom and Dad got to see how attending one of Bryan's games doesn't actually mean that you get to watch the game. I estimate that in the 40 minutes of game time, I get to really watch about 10 minutes of it and the rest of the time is spent keeping Dylan from running out onto the court. Oma and Papa brought Dylan some new books to read. He loves his "Little Golden" books, especially when Papa reads them. Against our advice, Dad tried to teach Dylan how to use the iPad. Mom and I would snicker each time we could hear him in the kitchen with Dylan saying "No, Dylan. Gently." and then we'd see Dylan stab his finger into the screen like he was trying to break through to the other side. Good idea, Dad. We took a nice bike ride to the Schloss Gemen and Dylan had a monster temper tantrum. He wanted me to carry him the entire lap around the castle and when I wouldn't he laid like this in the middle of the path and screamed for about 15-20 minutes. It was hard not to laugh at him, so we took this picture. 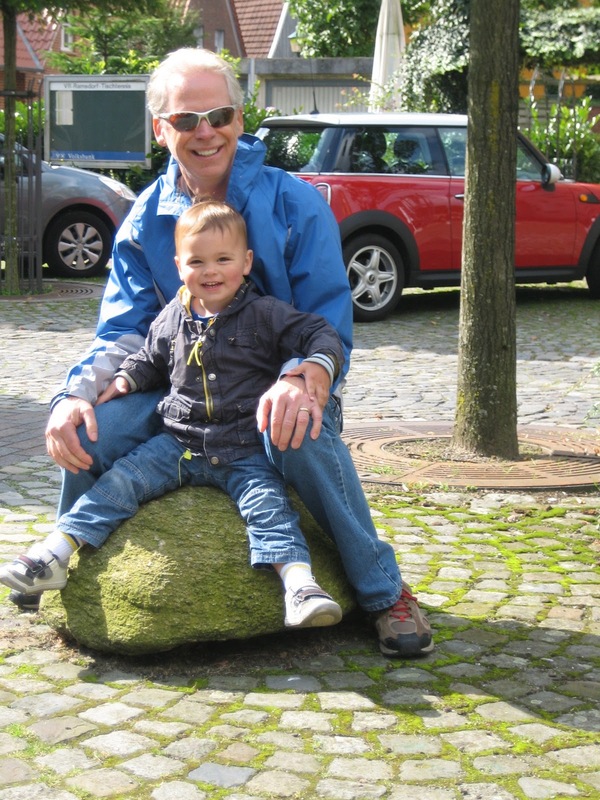 We were able to get a babysitter for an entire afternoon and evening so the four of us went into Dusseldorf and left Dylan at home. We did a semi pub crawl and tried 4 different kinds of Alt Bier (special to Dusseldorf) and had a delicious schnitzel dinner and enjoyed wandering around the city. Dusseldorf's riverwalk along the Rhein is really nice, especially when you don't have to chase a very fast toddler through the crowds. While Bryan was busy at work, the four of us rode our bikes on a super windy day to Raesfeld to check out the castle. One .. . two ... three ... swing! This never gets old to Dylan. Wherever Papa was, Dylan wanted to be also. If he sat down, Dylan sat down. If he went upstairs, Dylan followed. If he went into the bathroom and didn't lock the door, Dylan was coming in ready to say "What are you doing, Papa?" Sometimes the only way to get Dylan to look in the direction of the camera is to hold out something in front of him (like keys, candy, etc.). A familiar pose in photos with Dylan is holding him back so he won't run away when the photo is snapped. We also rode our bikes to Ramsdorf where we walked around town for a while. To Dylan, this was a really big rock. On Friday, we went into Muenster and walked along the promenade while Bryan worked. Dylan's favorite park here has an old airplane that you can climb in and pretend to fly. He's a very demanding little kid, so he climbed up the ladder and shouted "Papa! Oma! Sit down!!" and he had all of us sitting in the tiny little seats while he "flew" the plane. Dylan and Oma flying the plane. At any given moment throughout the day, Dylan would drop everything and shout "Papa! PRACTICE!" And he would drag my Dad into his room and close the door and make him practice basketball and golf with him. My poor Dad was not allowed to leave the room, and although Oma and Bryan were allowed in, Mommy (me!) was definitely not invited in the room. Dylan created a special little club in there, but whenever I tried to come in and see what they were doing he would shout "No, Mommy! Close the door!" and shove me out and slam the door in my face. Now that no one is here anymore, I'm invited to "practice" but it was kind of nice to be Dylan's least favorite playmate that week. Roughhousing with Papa - the highlight of Dylan's week. We had a fantastic week, and thankfully fantastic weather the whole time. It was so sad on Monday morning when Dylan woke up and immediately asked for Oma and Papa and I had to tell him that they had to go home. He took it really well and seemed to understand, but every day this entire week the first thing he says when he gets up in the morning is "Papa here? Oma here?" We're already looking forward to Christmas when we'll get 3 whole weeks at Oma and Papa's house. I can’t remember exactly where I saw this definition, but I have always defined being a world traveler by how many different languages you can order a drink/food. Based on this definition, if you can order drinks/food in six or more different languages, then you are a 'real' world traveller. I realize this is far from the truth, but I can’t help but define our travel experiences by adding as many new languages as possible to that number. That is part of what made our recent trip so exciting. I was able to get two steps closer to becoming a world traveler (as defined by me). Learning how to order something is really easy, though sometimes pronouncing it correctly is the difficult part. You really just need to learn six words: hello, one, two, three, please, and thank you. Learning these six simple words enables you to order up to 3 things from anywhere at any time. If our family grows, then I would have to learn the number four as well. After you receive the beer, you say, ‘Dank je weil.’ It’s as easy as that. Unfortunately, I got the ‘please’ pronunciation wrong while practicing at the Rotterdam ‘HM’ store and needed to have the cashier write out the correct pronunciation on a blank piece of paper, which kind of looked like I was getting her phone number from Dana’s standpoint across the store. When I finally got the pronunciation right at a 'Quick' fast food restaurant (Quick is a McDonald's like burger chain as well as one of the few places that accepts 2 year olds) I did a huge fist pump, shouted 'yeah, baby!' and startled the cashier as I lunged over the counter to give her a high five. I got this one correct on the first try and even had the waitress believing that I was a fluent speaker. That ended when the final tab came and I gave her the ‘I don’t understand you’ blank stare that we have now perfected over the past 12 months. No high fives were exchanged in Belgium or France (they are not really the high fiving type of people, in general), but I was able to easily tick French off the world traveler list. This means that I officially have 5 languages (English, Spanish, German, French, and Dutch) down and 1 more to go before officially becoming (in my own mind) a world traveller. Now this is a care package. It had something for everyone, including Oscar. Thanks Amy. I end this post with two questions: 1. Are there any other world traveler benchmarks to be striving for? 2. Should your native language count as one of the 6 languages? I already know Dana's answer for #2. Germany vs. Bosnia. Yup, we had pretty good seats, though we didn't meet Leonardo DiCaprio or Jack Nicholson sitting court side. Chris Kaman and his awesome wife, Emilie: My only friend who signs autographs for me after hanging out. Our one year anniversary of living in Germany is fast approaching and my day of reckoning is drawing near. What do I mean by 'Day of Reckoning?' Let me take a step back and fill you in. Last year, when we first arrived in Borken, there was a press conference set up for the local newspapers about us coming to live in Borken and play for the basketball club, RC Borken. We arrived in Düsseldorf the morning of September 10, and the press conference was in the evening on our first day there. I don't know if it was the jet lag or the excitement of living in a new country, but the first statement I blurted out at the press conference was quite bold. I confidently opended up the press conference by declaring, 'I fully intend to do this press conference next season totally in German.' Everyone nodded their head in approval and wrote it down on their notepads. I was convinced in my mind that this wouldn't be any problem whatsoever. That was when I believed that I would have German mastered in 6 to 9 months. The extra 3 months would give me time to really perfect my German speaking and listening comprehension. Maybe I could even learn some big words that would really impress the writers. In the following months, I found out that learning German is not something that can be achieved in 6-9 months (at least not for me). In fact, I have been told by other native English speakers living in Germany that it's closer to 2-3 years before you even start to feel comfortable trying to speak German. I believe them. Learning the language has proven to be a very long and difficult process. At this point, I am known as a 'streaky' German speaker/comprehender. That means I sometimes have good days and sometimes really bad days. There are days when I track (most) everything that's being said and can respond with the appropriate answer in German. The very next day, I could be talking to the exact same person and I will not understand a thing they are saying. The worst part about being so streaky is that if someone sees me on a good day, they don't believe me when I tell them I have no idea what they are saying. Here is our 1 year German assessment, broken down to 3 strengths and 3 weaknesses. Getting Around Town - This has become fairly easy for us. We can perform most basic communications with other people around town and feel comfortable doing so. Returning something at the department store is no longer a terrfiying experience that keeps us up at night and getting our haircut is not a nightmare anymore. This is still far from perfect. Just last week while at the grocery store, as I put my bottle of water and soda on the conveyer belt, the cashier was saying something to me about a sign at the end of her lane. I asked her to repeat what she said (this actually sometimes works now) but I still couldn't understand. I then went into 'assumption' mode and tried to anticipate what she was saying. Did she want me to leave the line? Did she want me put the bottles upright on the conveyer belt? I checked the end of the line and, yes, the sign was in place. I gave her the nod of approval and that was all she needed. When it was finally my turn in line, she didn't give me the total, she just faced the screen that said, '€1.35' at me. It was like my first day in Germany. Very embarrassing. Again, this is far from perfect, but I am now able to understand a lot of what we talk about at basketball practice. Because 95% of basketball practice is in German, I get a lot of good listening and speaking practice. 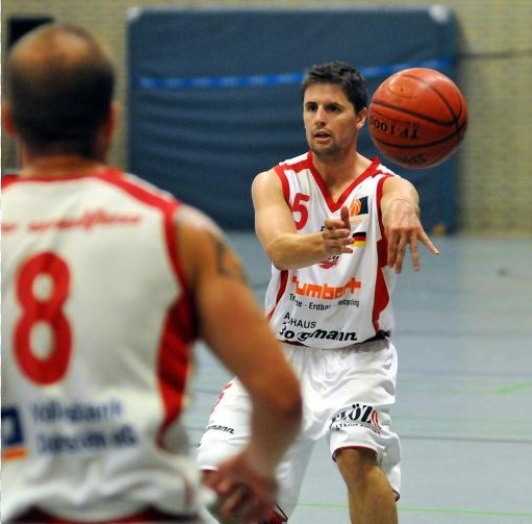 Additionally, I can ask questions about basketball in German and understand the answers. I am always surprised when I try to explain a drill in German when I am coaching and the players actually do what I intended them to do. For the most part, I feel comfortable speaking to people about their weekend, recent vacation, or school. As long as we stay on the surface, I can hang in there and stay engaged, all in Geman. I can also make basic plans with other people (picking up the car, or getting the keys for the gym) and confirm when I am supposed to be somewhere. In my opinion, this is the best part of speaking a new language; going end to end in a conversation all in German. The first few times this happened, I questioned whether I explained myself correctly or if we actually agreed on the same time. Now, I am more comfortable knowing that what I intended to say actually came out of my mouth. This is easily our biggest weakness. Using the telephone eliminates the option of reading someone's body language or watching their hand gestures. We have had some really awkward conversations over the phone. It seems that even as we learn more German, we are right back to step one if someone calls on the phone. It's so awkward that we fight over who is going to get the next phone call. We brace ourselves everytime the phone rings and always breathe a sigh of relief when we hear English on the other end. I am hoping this will improve over time, but this has proven to be very difficult for us. You can see from my German writing example that I have a really long way to go. I try to send out emails in German when they are basic, but overall, I don't get a lot of German writing practice. I am getting better at reading the newspaper and other emails at work that are written in German, but I still need to use Google translate more than I would like to admit. I am getting better at understanding the articles written about our basketball games and reading the sport section of the newspaper. There is a really easy to read newspaper called 'Bild.' Not surprisingly, 'Bild' (German for 'pictures') is full of pictures and is complimented by easy to read articles. It also contains 2-3 bare chested women per day (most other newspapers only have 1-2 bare chested women per issue) which makes it very awkward to read on a public train or bus. Can you imagine USA Today or better yet, Grand Rapids Press having a front page and a Page 2 naked woman on it every day? Would Cornerstone and Calvin ban periodicals/news sources from campus? We will keep you posted on how our learning progresses. For our expat friends, how long has it taken you to learn German?